The Ravens came close to reaching the Super Bowl last year. They got that far with a mixture of tricks on offense and a great defense. Last season the Ravens broke out an unbalanced line (a specialty of offensive coordinator Cam Cameron), as well as the wildcat. In addition to that, the Ravens used more max-protection schemes and play-action passes than any other team in the NFL. This served to protect rookie quarterback Joe Flacco but the onus will be on Flacco to develop. The offensive line looks strong, as the Ravens signed Matt Birk at center and drafted Michael Oher to play right tackle. Left tackle Jared Gaither is a physical specimen (6-9, 330 pounds), and if he can cut down on his penalties the Ravens will have a great pair of young tackles. The Ravens look to have a three-headed running game with Willis McGahee, Ray Rice, and Le’Ron McClain splitting carries. None are game breakers but McClain is good in power situations and Rice is a nice scatback. I am a big fan of running back Cedrick Peerman, a sixth-round steal for the Ravens. Wide receiver Derrick Mason has been Flacco’s favorite target, but had a dislocated shoulder last season and is not back to 100%. He is also 33 years old, which is well after when wide receivers are expected to decline. WR Mark Clayton has his own injury concerns but put up some big numbers when healthy. Tight ends L.J. Smith and Todd Heap are both past their prime, although Heap was still productive last year. I love defensive tackle Haloti Ngata. He’s a great player and is only 25 years old. He’ll be joined by Kelly Gregg and Justin Bannan. Defensive end Trevor Pryce is getting up in years but the Ravens drafted Paul Kruger to help spell him. Middle linebacker Ray Lewis is also getting up in years but has maintained a high level of play. He’ll miss having Bart Scott around as Scott was an impact player. The Ravens franchised Terrell Suggs, who should continue to provide a strong pass rush from the outside. Even without Scott the Ravens have a strong front seven, but it would be unreasonable to expect them to perform as well as they did last season. The Ravens have a strong core in the secondary. Cornerbacks Fabian Washington and Domonique Foxworth were both impressive last season. Free safety Ed Reed is a legend, although he is going to have to play through some nagging nerve injuries. Strong safety Dawan Landry has recovered from a spinal cord concussion and looks to be ready for the season. The Ravens have solid depth in their secondary and should be able to withstand an injury or drop in performance. Punter Sam Koch was highly effective and the coverage teams look to improve with the addition of gunner Kelley Washington. Overall the Ravens had slightly above average special teams last season. I don’t expect the Ravens to miss defensive coordinator Rex Ryan, but they might miss some of the players he took with him to NY. 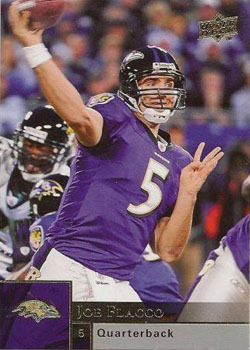 Much of the Ravens’ 2009 success will come down to the effectiveness of Flacco and the passing game. Since I am not sold on either I’ll settle on a 9-7 record. This is a dysfunctional franchise. When your fans are willing to pay to have an airplane fly over your training facility pulling a sign that requests you hire a GM, you know something has gone wrong. In the case of the Bengals, a lot of things have gone wrong. 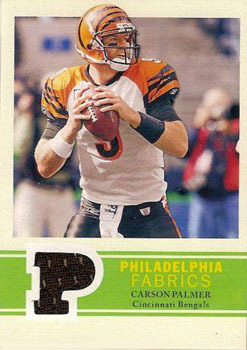 Quarterback Carson Palmer has been a star but has also suffered serious knee and elbow injuries. The offensive line has suffered numerous maladies. Actually, let me focus on the offensive line. The 2008 Bengals offensive line was the worst offensive line in the NFL. It has been replaced. The Bengals drafted Andre Smith with the sixth pick of the ’09 draft. While I applaud the move in principle, I think the Bengals drafted the wrong player. Drafting offensive linemen is a good move in general, but Smith signed with an agent before the Sugar Bowl, thereby rendering himself ineligible. That was an exceedingly selfish move. He finally signed with the Bengals on August 30, thereby missing much of training camp. He was a dominant run blocker in college, but his character issues and me-first attitude would have led me toward Eugene Monroe. Monroe was similarly dominant in college, although more of a pass-blocker than Smith. In any event, Smith has been signed and will likely be the starting right tackle. Anthony Collins looks to be the new left tackle. Rookie center Jonathan Luigs will be an upgrade but I think he might be better in a zone-blocking system. The Bengals were wise to invest in their offensive line, but even so the line will probably not be one of the stronger such units in the NFL this season. (Update: Smith signed late, then immediately proceeded to injure his foot. That shouldn’t matter much in the long run, but his development has clearly been set back). In addition to offensive line concerns and injury woes at quarterback, the Bengals have to deal with a wide receiving corps on the decline. T.J. Houshmandzadeh has left and Chad Ochocinco is in decline. The Bengals aren’t lacking in decent receivers as Laveranues Coles (also past his prime), Chad Henry (a deep threat with plenty of off-field character issues), and Andre Caldwell (a promising second-year player) round out a mediocre receiving corps. The Bengals’ tight end production was awful and they addressed this issue in the draft. Rookie tight end Chase Coffman is not an elite prospect but he should be an improvement over the current options. The Bengals signed running back Cedrick Benson to a two-year deal but he is considered a placeholder until the Bengals find a better choice in the 2010 draft. Actually, the Bengals might have found a replacement in the 2009 draft with Bernard Scott, but the only notes I have on him are “character issues, five arrests in college, led Division II in scoring.” Welcome to Cincinnati Mr. Scott, you’ll fit right in. The Bengals defense’ was terrific against the run for the second half of the 2008 season. Defensive tackle Domata Peko was a revelation and this season he will be joined by Tank Johnson and Jason Shirley. DT Pat Sims was also quite good, although not as good as Peko. The biggest problem for the Bengals’ defense was a lack of a pass rush. The Bengals were ravaged by injuries, but even so their pass rush was terrible. For the Bengals to improve, defensive ends Robert Geathers and Antwan Odom have to be more consistent in pressuring the quarterback. The Bengals drafted pass-rush specialist defensive end Michael Johnson in the third round. The Bengals do possess a pretty good linebacker corps, but like the defensive line it is much better against the run than the pass. Inside linebacker Dhani Jones and outside linebacker Keith Rivers are both impact players, and the Bengals added inside linebacker Rey Maualuga in the draft. Maualuga dropped to the second round due to character issues, but in Cincinnati that doesn’t seem to be a problem. He has first-round talent and is an extremely physical player. Like the rest of the Bengals’ defense the secondary was ravaged by injuries. It is very difficult to judge a secondary that had to work without the benefit of a pass rush, but cornerbacks Leon Hall and Jonathan Joseph have not developed as quickly as the Bengals had hoped. Free safeties Chris Crocker and Marvin White were effective for the Bengals. Strong safety Chinedum Ndukwe is effective in run support, but less effective in coverage. The Bengals signed strong safety Roy Williams, another strong hitter who is weak in pass coverage. Punter Kyle Larson was awful for the Bengals in 2008 and has been replaced by rookie Kevin Huber. Overall, the Bengals’ special teams were lousy, but given the expected improvement in punting performance and the various other holes on the roster, I’d say the special teams should not be one of the Bengals’ main concerns. I have to agree with the fans: the Bengals need a dedicated general manager. Also, if someone could explain to me why the Bengals were so bad after halftime (outscored by eight points in the first half, 152 in the second), I’d appreciate it. If things go well for the Bengals I could see seven wins, but six is more likely. The Bengals have the potential to implode due to a variety of character issues, or simply from another injury to Palmer. They go 6-10. At the end of last season, Browns ownership realized they had a problem. They fired coach Romeo Crennel and general manager Phil Savage. Crennel has been replaced by the “Mangenius,” while George Kokinis has replaced Savage. Both moves will undoubtedly be improvements, although it will take time for the moves to pay off. Kokinis and the Mangenius have worked to rebuild the roster and purge it of malcontents. Tight end Kellen Winslow was shipped off and wide receiver Braylon Edwards was dangled in trade talks. The Browns traded down in the draft to accumulate extra draft picks, and managed to snag safety Abram Elam from the Jets in a trade. The Browns hope they have their quarterback of the future on the roster but quarterback Brady Quinn has yet to show he can handle the NFL. Quarterback Brett Ratliff is a favorite of the Mangenius and he’ll be the beneficiary if Quinn stumbles. Plan C has worked before but Derek Anderson also has proven he is not a reliable option. Running back Jamal Lewis is no longer the bruising power back he once was and is now merely another old physical running back. RB Jerome Harrison should get more of the workload this season. The Browns drafted running back James Davis in the sixth round but I don’t expect him to see too much action this season unless he blows away the team in practice. The Browns realized their wide receiver corps was in shambles and took care of this in the draft. 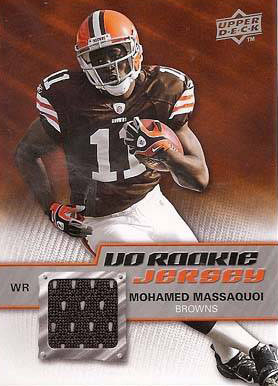 Wide receiver Mohamed Massaquoi is notable for having a great work ethic and lousy hands. You can train a wide receiver to catch with the JUGS machine. WR Brian Robiskie is expected to step into the starting lineup across from Braylon Edwards. Both Robiskie and Massaquoi are large physical receivers who will help with blocking for the running game. Edwards still has the talent to be a No. 1 receiver but he should also spend some more time with the JUGS machine, as his drops increased last season. In addition to fortifying the receiving corps, the Browns improved their offensive line via the draft. Center Alex Mack should provide an upgrade over Hank Fraley. Left tackle Joe Thomas regressed badly in his sophomore season but that should prove to merely be a blip over a long and productive career. Right tackle John St. Clair struggled a bit as a left tackle but should be fine on the right side. The Browns have solid depth along the rest of their offensive line and should be able to provide good protection for whoever wins the starting quarterback job. Defensive tackle Shaun Rogers is still an excellent player, but not quite the dominant stud he used to be. Unfortunately for the Browns he’s the only semi-dominant player they have along their defensive line. Defensive end Corey Williams has shown some talent while with Green Bay, but has not produced much for the Browns. Inside linebacker D’Quell Johnson leads an improved linebacker corps. Jackson was exceptional for the Browns in 2008 (154 tackles, two sacks, three INTs), and will be working with former Jet Eric Barton as well as rookies David Veikune (a converted defensive end), and Kaluka Malava. If the defensive line can keep blockers off the Browns linebackers, they should have a very productive season. Three of the four starting defensive back positions are well manned. The Browns acquired strong safety Abram Elam from the Jets. Free Safety Brodney Pool returns, as does cornerback Eric Wright. Both have performed well for the Browns, and both are young (Wright is 24, Pool is 25). Cornerback Brandon McDonald was demolished early in the season but redeemed himself a bit versus the Eagles. The Browns have plenty of cornerback depth, but the level of talent is questionable. I would be remiss if I didn’t mention special teams ace Josh Cribbs. He is an excellent gunner as well as a solid kick returner. Both punter Dave Zastudil and kicker Phil Dawson are good players. The Browns have a variety of weaknesses but their special teams are not among them. The Browns should be decent on defense but lousy on offense. They should get six wins because of a soft schedule but it is clear the Browns are not built to win now and are trying to build for the future. They go no better than 6-10. 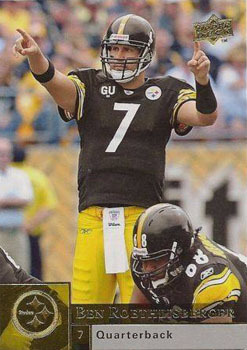 Roethlisberger doesn’t produce the best stat line. He holds the ball while trying to make plays and gives up numerous sacks other QBs would avoid. Of course, his offensive line also lets in numerous defenders that other offensive lines block. Roethlisberger is exceedingly tough, but over the last three seasons he has thrown 49 interceptions and fumbled 28 times. The Steelers’ offense has struggled against the blitz, which actually makes a lot of sense given the weaknesses of the offensive line and Roethlisberger’s style. Left tackle Max Starks was franchised, a move the Steelers made due to need and not due to Starks being a truly dominant player. The Steelers drafted Kraig Urbik in the third round and he should be able to step in at right guard, or even right tackle in an emergency. Injuries have robbed running back Willie Parker of some of his athleticism and he will probably have to share more carries this season. The Steelers expected RB Rashard Mendenhall to become their next feature back but he suffered a shoulder injury that ended his season. RB Mewelde Moore filled in and was quite effective for the Steelers last season. If all three can stay healthy, the Steelers have a nice selection of running backs. Mendenhall is the most likely of the three to have a breakout season. Wide receiver Santonio Holmes isn’t quite as good as he looked in the Steelers’ playoff run, but he has taken over the role of the Steelers No. 1 wide receiver. If he can improve his catch rate he’ll become one of the AFC’s star receivers. WR Hines Ward is an excellent possession receiver and should be able to handle his change in roles quite well. WR Limas Sweed has the talent to eventually become a No. 1 receiver, but right now he is struggling to land the No. 3 job. Rookie WR Mike Wallace is a speedster who will help stretch the field and return kicks. The Steelers’ defensive line is still strong but it is aging, as all of their starters are over 30. The Steelers drafted Ziggy Hood to fill in at defensive end. Nose tackles Casey Hampton and Chris Hoke have shared snaps for over eight seasons. Clearly, the Steelers like what they have at defensive tackle. The great strength of the Steelers defense is its linebacker corps. The returning starters managed 36 sacks last season. Don’t worry about the loss of Larry Foote, as Lawrence Timmons looks to be a strong replacement. The Steelers rarely pay top money for linebackers, as they usually prefer to develop them, but James Harrison is a worthy exception. He was one of the most dominant linemen in the NFL last season and should remain strong for several years. Just as a weak pass rush makes a good secondary look bad, a great pass rush protects a weak secondary. Strong safety Troy Polamalu is the best safety in the NFL, but the rest of the secondary is pedestrian. Free safety Ryan Clark and cornerbacks Ike Taylor and William Gay usually play cover-3, and as such are responsible for stopping big plays instead of trying to make them. Still, with the kind of pass rush the Steelers possess that makes a certain amount of sense. No reason to take a huge risk to produce a big play when your front seven will likely provide a big play to stop an opposing drive. The Steelers’ special teams units are in flux and are tough to judge, but kicker Jeff Reed does a great job given the conditions he has to play through in Pittsburgh. The Steelers have excellent coverage units, but the return units could use some work. The Steelers remain the class of the division, a step ahead of Baltimore. I wouldn’t be shocked by a repeat of last season, but concerns about the offense lead me to believe 11-5 is the likely outcome.